This card is one of the best selection of HQ PaperMaker. This card is produced by 100% high quality handmade mulberry card stock 0141 and handmade smooth mulberry envelope 0121 from HQ PaperMaker. 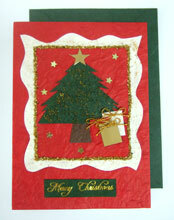 The card size is 4.7"x 6.7" and come with baronial style envelope of which size is 5"x 7".